Are you familiar with Chocolate Amatller Barcelona? Yes, they make great tasting chocolate, but they are also famous for the elaborate Art Nouveau style illustrations, mostly by Alphonse Mucha, printed on their chocolate tin boxes. 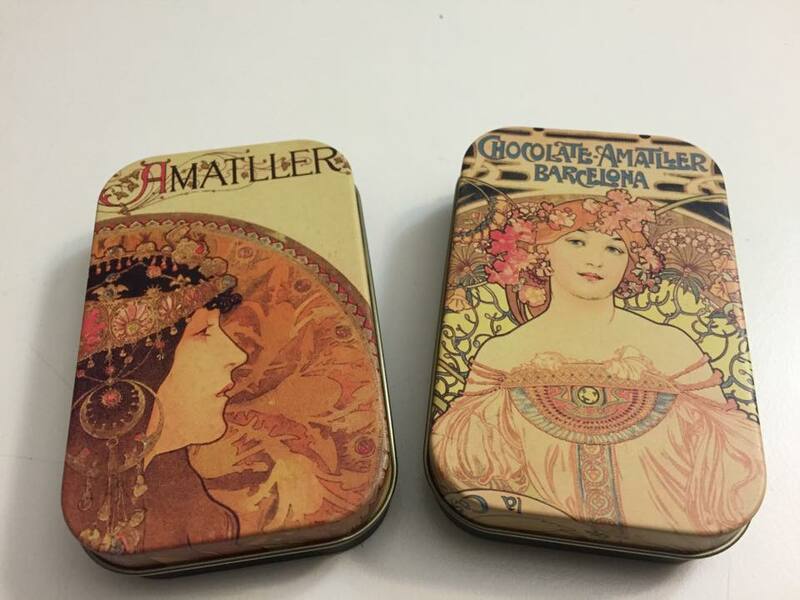 In spite of the clear indication where the company is based from its title, Chocolate Amatller Barcelona, it seems to me many people can buy those fancy chocolate tin boxes as souvenir from different countries around the globe. For me, it was my friend’s gift from her stay in Paris. One day I saw a twitter feed saying now Chocolate Amatller Barcelona products are sold in Dubai… It may seem inadequate to show Barcelona’s authenticity anymore. However, I still recommend you to look for those chocolate if you have a chance to be in the city. You can find them in the gift shops of major museums or many heritage buildings in Barcelona. So it is already a pretty good way to check out the city’s cultural sides. Art Nouveau, also called Modernisme movement in Barcelona was a big deal during the late 19th to early 20th Century, thanks to the perfect marriage of the bourgeoisie clients’ romanticism in patronage and the dandy bohemian artists. The result is today’s Barcelona being the city with the most UNESCO world heritage sites, all nine of them are works of the Modernisme. Seven out of those nine are designed by Antoni Gaudí. I dare to say that Gaudí is the most distinctive Catalan Modernisme artist due to his unique style that combines the nature, spiritualism, and the space. It is true that Art Nouveau typically takes natural forms, mostly plants, in its highly decorative style. What makes Gaudí stands out the most is the variety of natural forms he got inspired by. On Passeig de Gràcia, one of the major boulevards in Barcelona, you will find Casa Milà designed by Gaudí. Its second name is La Pedrera (the stone quarry). As one can easily guess, there is a high resemblance between the building’s façade and the nature’s open quarry. The building’s shape of the exterior continues to the interior by continuous curvatures, from which some people have the vision of waves or even clouds. Just a few blocks away fromCasa Milàis another Gaudían building,Casa Batlló. When you walk along Passeig de Gràcia from Casa Milà to Casa Batlló, don’t bother being too preoccupied looking at the buildings’ street numbers or the names of cross streets to look for your destination. 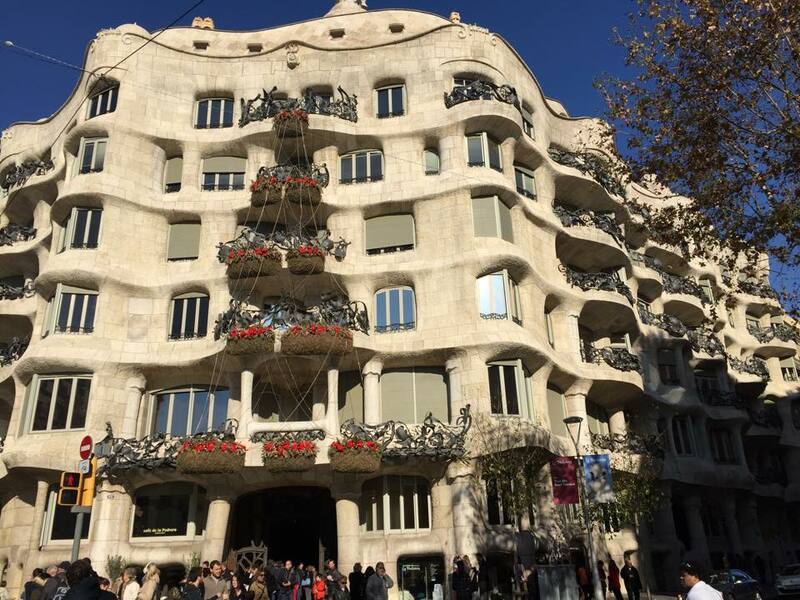 There is no way you will miss either Casa Milà or Casa Batlló because of the buildings’ unusual, almost theme park resonating, façades, and also because of the great number of tourists gathered around the buildings any time of a day. Instead, take a look at the Modernisme pavement tiles and streetlights, saturated with floral and geometric patterns. Gaudí had designed the pavement tiles. The streetlights are works of another Catalan architect, Pere Falqués i Urpí. 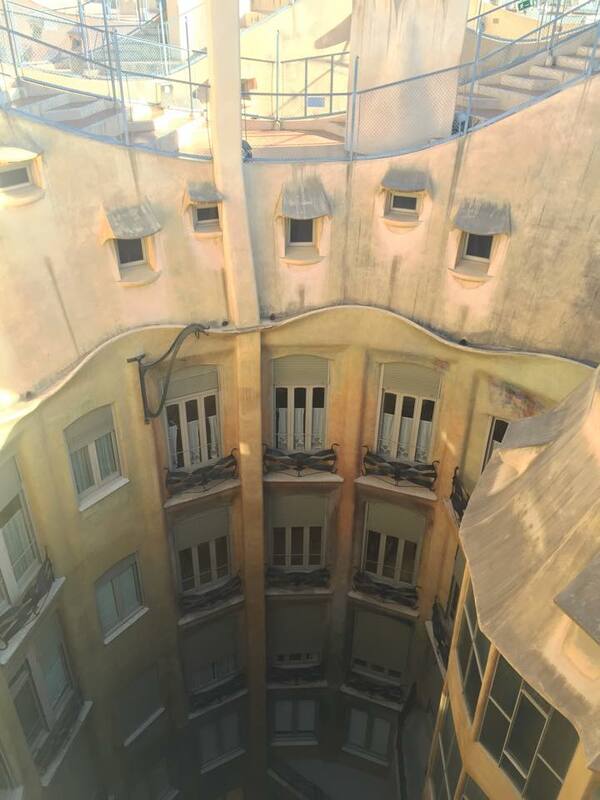 Finally, you reach Casa Batlló, known for colorful tile mosaics on its façade and the balconies’ skeletal organic quality, hence its other name, La CASA does Ossos (the House of Bones). Right next to Casa Batlló is another multi−color tiled building called Casa Amatller. Ringing a bell? Chocolate Amatller Barcelona! The building was originally designed as a residence for chocolatier Antoni Amatller. 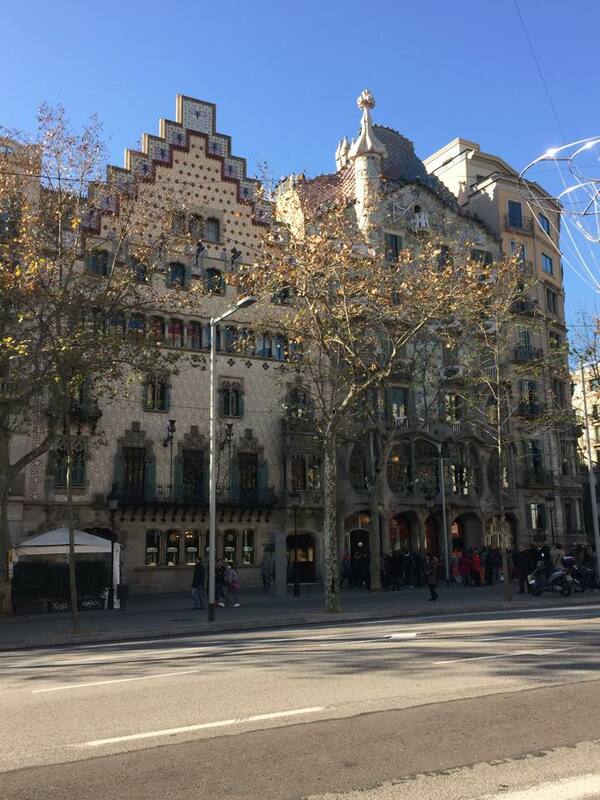 The little walk along Passeig de Gràcia that I have described is the centre of Barcelona’s Modernisme designs filled with different styles of Catalan Art Nouveau architectures. These days, one can buy Chocolate Amatller Barcelona products from eBay. However, I bet the taste of Chocolate Amatller Barcelona walking on Passeig de Gràcia would be even sweeter. This entry was posted in International Art, No Category and tagged architecture, Art Nouveau, Barcelona, Gaudi, Modernism, Mondrnisme, Passeig de Gràcia. Bookmark the permalink.